Reading the Classics (Classic Devotional Books) can renew your intimacy with Jesus in a special way. I’d like to share with you how this spiritual discipline works and then I have a list of recommended Classic Devotional Books for you to read. Actually most Christian books on the best-seller lists today don’t come close to matching the impact the Classic Devotional Books have on our relationship with God. God’s glory shines powerfully through the lives of these authors who were especially devoted to Christ and his Gospel. Jesus took his closest friends, Peter, James, and John, up a mountain. 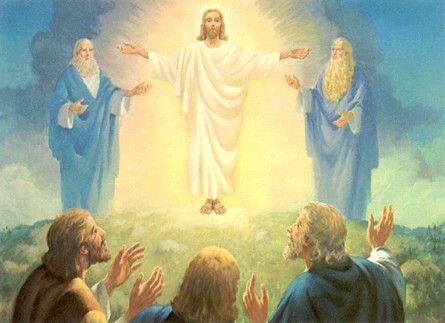 There he was transfigured before them. His face shone like the sun, and his clothes became as white as the light. Just then there appeared before them Moses and Elijah, talking with Jesus… A bright cloud enveloped them, and a voice from the cloud said, “This is my Son, whom I love; with him I am well pleased. Listen to him!” (Matthew 17:1-3, 5). Here Jesus revealed his glory as the Son of God. We know this. What we may not appreciate is that this happened in the context of his deep soul friendship with Moses and Elijah. The three of them were caught up in the glory of God! Jesus is the “I AM”, beyond space and time, so he was friends with Moses, Elijah, and all the other saints of the Old Testament long before his incarnation. But in the limitations of his human flesh he needed to go back in time to once again befriend the great saints of the past. He did this, not only in the miracle of his transfiguration, but also throughout his life in the ordinary way of reading old spiritual writers. We know this because he frequently quoted from Moses and Elijah, as well as David, Ezekiel, and others. If Jesus found it important to be drawn closer to God by learning from the lives of exemplary men and women of the past how much more do we need to do this?! Jesus’ Apostles followed the Lord’s example, befriending the Old Testament saints. Down through the history of the church great men and women of God have the same testimony: reading the lives of saints especially devoted to the Lord has drawn them into greater intimacy with Jesus and a manifestation of God’s glory that blesses others. The Scriptures, Christian hymns, biographies of the saints, and classic devotional books provide a rich source of sacred companionship for all Christians. A.W. Tozer was perhaps the greatest Evangelical Pastor of 20th Century. And he wrote The Pursuit of God, a favorite devotional book that I have re-read many times. He wrote: “Come near to the holy men and women of the past and you will soon feel the heat of their desire after God” (p. 15). He says, “The whole testimony of the worshipping, seeking, singing church” leads us into living by an “experiential heart-theology of a grand army of fragrant saints” (Tozer, p. 16-17). Every age has its own outlook. It is specially good at seeing certain truths and specially liable to make certain mistakes. We all, therefore, need the books that will correct the characteristic mistakes of our own period… The only palliative is to keep the clean sea breeze of the centuries blowing through our minds, and this can be done only by reading old books (“On the Reading of Old Books,” God in the Dock, p. 202). Lewis believed it was so important to read the old spiritual books that he recommended everyone read two classics for every one new book they read. Of all human writings the lives of devout persons and eminent saints are [Miranda’s] greatest delight. In these she searches as for hidden treasure – hoping to find some secret of holy living which she may make her own. By this means Miranda has her head and her heart so stored with all the principles of wisdom and holiness that if you are in her company you must be made wiser and better (p. 56). Speak the Language of the Soul at the Center! Thomas Kelly was a Quaker writer and missionary, a great Evangelical Christian leader, who was transformed for Christ by reading from ancient spiritual treasures. He experienced a tremendous spiritual renewal through gathering with friends to read devotional classics that, in his words, “speak the language of the souls who live at the Center” (A Testament of Devotion, p. 55). His weekly meetings with sacred companions and anointed devotional books featured readings, silence, conversation, and prayer. Their cell group was like a “little religious order” that became a spiritual dynamo for revitalizing their lives and ministries to others (Douglass Steere, A Biographical Memoir of Thomas Kelly). In fact, it was this group that stirred the “Shekinah of the Soul” in Kelly and ultimately led to A Testament of Devotion, one of the most compelling writings of devotion to Christ in history. I was so moved reading A Testament of Devotion that I was literally brought to my knees and stayed there. I kneeled at my tear-stained ancient wooden prayer bench and prayed for three full hours until I had prayerfully read through the entire book! I’m not alone in my reverence for God’s revelation through Thomas Kelly’s testimony. After befriending Thomas Kelly through his book Richard Foster remarked, “Each time I leaf through the pages of this book, I know I am in the presence of a giant soul” (from the Introduction). So it’s no surprise that second to the Bible, I find the classic Christian devotional books the most helpful reading for my own relationship with God because they offer Christ to my heart simply, authentically, passionately… and usually in a short book! In the pages of the classics I meet holy men and woman who see God and life with him differently than we do today. They offer an ancient wisdom that I need. They open their heart to me and their holy desire for God is a fire that warms my heart and draws me closer to Christ! So in the words of David and our Lord Jesus Christ himself, I “take heart” from these saints (Psalm 27:14, 31:24; Matthew 9:2, 22; John 16:33), absorbing their devotion to Christ and making it my own. And I love sharing the Christ-loving words and warmth of these sacred companions with my friends! To purchase the books below from Amazon at their best price click on the blue highlighted links. A portion of the sale will go back to the nonprofit ministry of Soul Shepherding. The Wisdom of the Desert (Sayings of the Desert Fathers from the 4th Century) Collected by Thomas Merton. 191 pages. Writings from the Philokalia on Prayer of the Heart by the Eastern Church Fathers, © 4th to 15th Cent. 420 pages. Athanasius: The Life of Antony by St. Athanasius, © 356. 166 pages. The Life of Moses by Gregory of Nyssa, © 390. 208 pages. A Simple Way to Pray by Martin Luther, © 1535. 62 pages. Interior Castle, by Teresa of Avila © 1580. 241 pages. Introduction to the Devout Life by St Francis de Sales, © 1609. 246 pages. The Life of God in the Soul of Man by Henry Scougal, © 1677. 138 pages. Pilgrim’s Progress, John Bunyan © 1678. 191 pages. The Essence of George Fox’s Journal by George Fox, © 1694. 253 pages. The Sacrament of the Present Moment (1966 edition of Abandonment to Divine Providence) by Jean-Pierre de Caussade, © 1741. 103 pages. Answers to Prayer (from George Mueller’s Narratives) by George Mueller, © 1896. 125 pages. The Healing Light by Agnes Sanford, © 1947. 173 pages. The Pursuit of God by A.W. Tozer, © 1948. 128 pages. Life Together by Dietrich Bonhoeffer, © 1954. 122 pages. Don’t be overwhelmed with this list of the great ancient books! As always, in the spiritual life it’s important that we begin from where we are and take a small step. In “My Top 5 Classics of Christian Devotion” I preview five of the books listed above. Perhaps one of these is the place to start for you. Streams in the Desert by L.B. Cowman, © 1925. 509 pages. My Utmost for His Highest by Oswald Chambers, © 1935. 278 pages. Spiritual Classics: Selected Readings for Individuals & Groups by Richard Foster and Emilie Griffin, © 2000. 377 pages. The Cyber Hymnal is a treasure of ancient hymn lyrics and tunes: http://www.cyberhymnal.org. To purchase the books above from Amazon at their best price click on their blue highlighted links. A portion of the sale will go back to the nonprofit ministry of Soul Shepherding.